Geshur was a territory in the northern part of Bashan, adjoining the province of Argob (Deut. iii. 14) and the kingdom of Aram or Syria (II Sam. xv. 8; I Chron. ii. 23). It was allotted to the half-tribe of Manasseh, which settled east of the Jordan; but its inhabitants, the Geshurites, could never be expelled (Josh. xiii. 13). In the time of David, Geshur was an independent kingdom: David married a daughter of Talmai, King of Geshur (II Sam. iii. 3). Her son Absalom fled, after the murder of his half-brother, to his mother's native country, where he stayed three years (ib. xiii. 37, xv. 8). Geshur is identified with the plateau called to-day "Lejah," in the center of the Hauran. There was also another people called "Geshurites" who dwelt in the desert between Arabia and Philistia (Josh. xiii. 2 [A. V. "Geshuri"]; I Sam. xxvii. 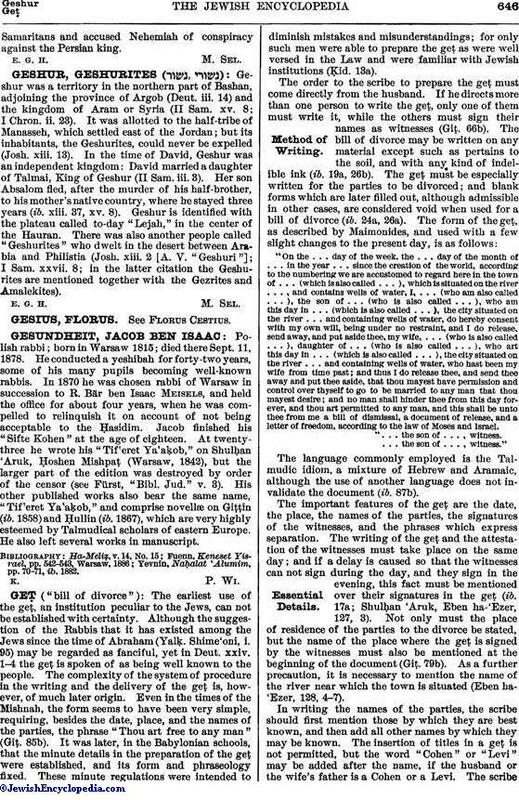 8; in the latter citation the Geshurites are mentioned together with the Gezrites and Amalekites).